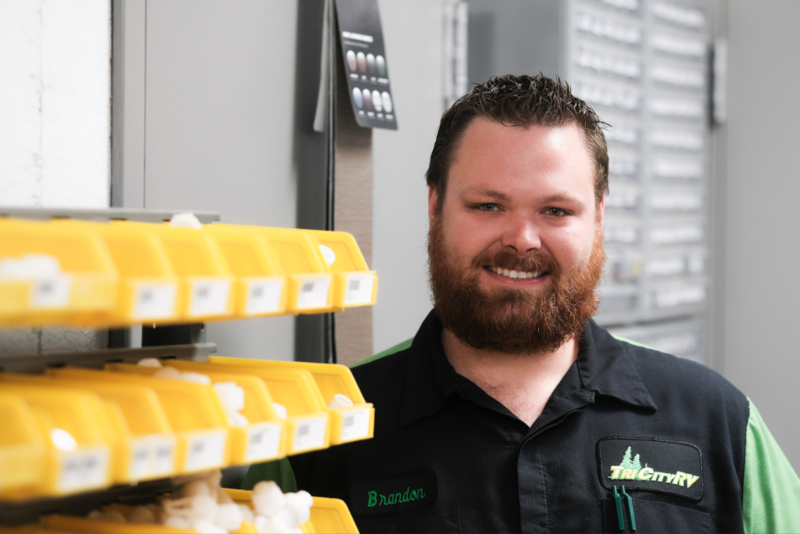 Brandon has worked in our Parts Department since 2016. Today, he’s the Parts Lead and loves the challenging tasks the job presents every day. In his free time, Brandon enjoys working on vehicles, racing in Figure 8 derbies, and trail riding on ATVs. One thing I enjoy most about camping is getting away from the hustle and bustle. I enjoy having to stay on my toes because the RV industry is always changing. The best meal would be a full-course steak dinner cooked over an open fire. My favorite place to go camping is Silver Lake. I enjoy this the most because of the sand dunes. Taking my quad there is a blast. One thing I love about America is freedom. Without freedom we wouldn’t be able to do most of what we all do. We wouldn’t have the privilege to go camping and enjoy the outdoors. I’m grateful for my family, whether it be at work or at home. Family will always push you to succeed. My pledge is to always provide the best customer service possible.